Preheat oven to 200°C (400°F). Place the ricotta, parmesan, goat’s cheese, lemon rind, salt and pepper in a large bowl and mix well to combine. 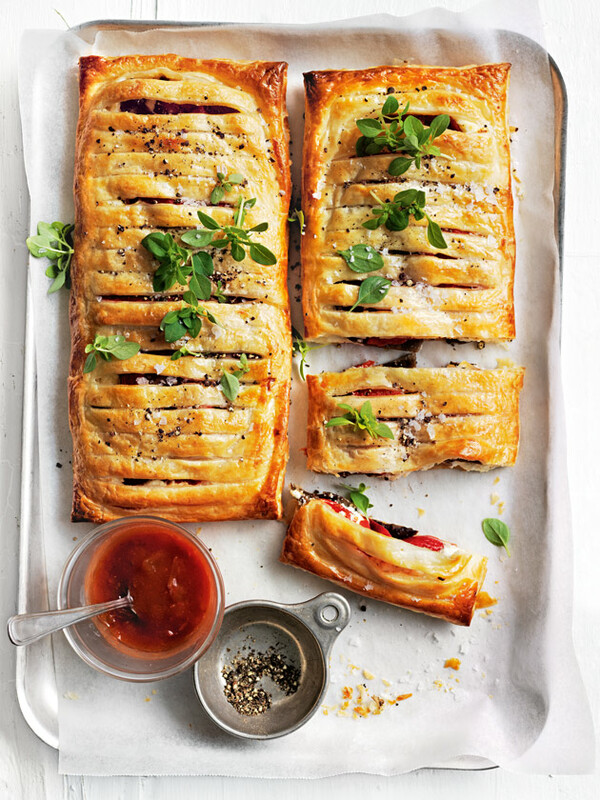 Place 2 pastry halves on a large baking tray lined with non-stick baking paper. Top with the ricotta mixture, leaving a 2cm border. Top with the capsicum and eggplant. Gently fold the remaining pastry halves in half lengthways. Cut slits into the pastry, 1cm apart, leaving a 1.5cm border. Carefully unfold. Brush the pastry borders with egg and place the cut pastry halves over the filling to create 2 parcels, pressing the edges to seal. Trim the edges and brush the tops with egg. Bake for 20 minutes or until golden and the pastry is cooked. Top with basil, salt and pepper and serve with tomato chutney. Serves 4.